We have just inaugurated a new field trip to Morocco with grand success for our masters program*. The idea is to give our masters students experience in “the field” before they head off for their independent fieldwork for their masters thesis. We sought to expose them to the pleasures and challenges of fieldwork that involves linguistic, cultural, and logistical barriers, and build their “soft skills”. 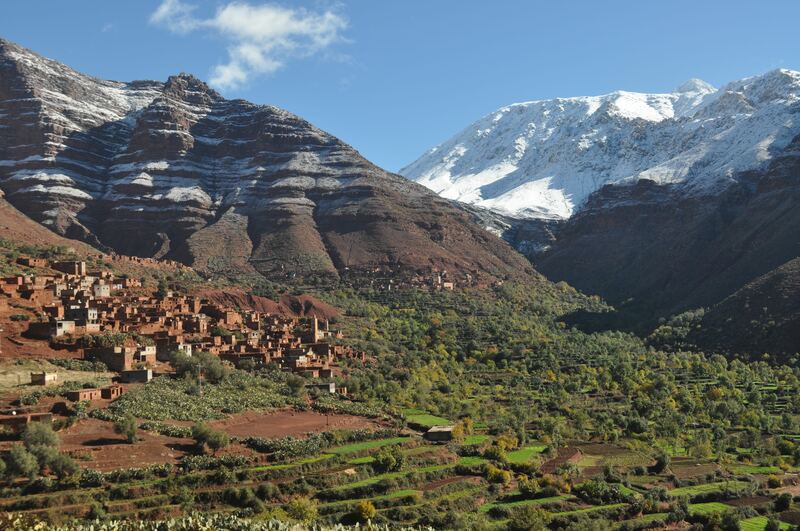 To do so, we brought them to a cluster of villages perched on a mountain side in the High Atlas, and – during 4 days of intensive field surveys, interviews, muddy boots, and mint tea – learn what we could about how the villages manage their water, their waste, their cropfields, their pastures, and the touristic potential of the region. During the closing ceremony of the 2011 International Geographical Union (IGU) regional meeting in Santiago, Chile, two students discretely entered and distributed small flyers alerting attendees to the conference venue’s history of torture during the regime of Pinochet (see images below). They were gently escorted out by military officers in white dress uniforms. After a few more platitudinous speeches by the conference luminaries, the students came back, this time with a paper banner that a military officer succeeded in ripping apart. As they were again guided out, one shouted words that were obviously not translated by the interpreters in their booth. The speeches resumed as if nothing had happened.